On Wednesday afternoon, my husband and I took the kids to the Magic Kingdom. Everything was going great until Splash Mountain broke down...while we were on it. We were deep inside the fake mountain when it happened. To our left was a large animatronic bear, singing "Zippa-dee-doo-dah." To the right was a rabbit robot wearing overalls and a straw hat. It could have been worse. I'm not sure how, but it could have been. After a few seconds, the person sitting next to me tapped my shoulder. "I have to go to bathroom," he whispered. The fact that we were floating down a fake river didn't help. "I've gotta go super bad," he whimpered. He began crossing and uncrossing his legs. I told him to to close his eyes and not look at the water. Five minutes later, things began to get desperate. It wasn't a matter of if I was going to be sitting in a puddle of urine (or worse), but when. By this point, I also wanted to punch the singing bear. "Hang tight," I told him. "Take deep breaths. You can do this." After five more minutes had passed, I began to giggle. There was something vaguely amusing about sitting in a hollowed out log next to a child who needed to produce one. There was also something horrifying. "Please hurry. Please hurry. Please hurry." I hoped that God could hear me over all the singing. After what seemed like forever, the log jam (pun intended) cleared and we were on our way again. Long story short: he made it. Thankfully. The young man who helped us off the ride apologized for the technical difficulties. I didn't stop to chat. Instead, I picked up my son and ran. Looking back, I am filled with sympathy for my son. The experience has left him scarred for life. Or so he claims. I also can't help but feel badly for the ride operator. I was preoccupied, but as I brushed past him, I couldn't help but notice that he was wearing khaki pants and a flannel shirt...that appeared to have been sewn together. I'm surprised you didn't ask if it was just a tinkle and let him pee in the fake river. Oh geez I would have peed myself with the anxiety of it all. I thought you were going to say you just picked it up and held him over the river and let him go at it but glad to see you both made it out. Just think of the money you'll save on future trips to disney world, since he's "scarred for life" and all. That happened to us when we went on that ride, too!! I think it breaks down a lot. Oh the toilet drama!! We have had a few of those "incidents" this last week which I also blogged about!!! my son did pee in the log while we were going down the waterfall. I had to buy him a pair of new shorts and he went commando the rest of the day. Our ride didn't break down though, he just didn't go before we got in line. I got stuck on that ride for like 15 minutes once! We moved about 10 yards after 10 minutes then stopped for 5 more. But we got some fast passes! It could have been worse for your son, you could have undone his pants to hurry it along so he didn't wet himself like a toddler. That, would have really scarred him. We got stuck on the Pirates of the Carribean ride at Disneyland for about half an hour once. My then 2-year-old son happened to have diarrhea that day. But it could have been worse. We could have been stuck in Small World. That's epic! I can just picture it! Long day & needed a good laugh! http://richfaithrising.blogspot.com/ ....because life IS a poem! Oh we got stuck there last summer! And there was a recording that kept saying "looks like Brer Bear is causing some trouble downstream!" Yes. It's still stuck in my head. I was stuck on the same ride! Only I didn't have a child who was ready to pee in the fake river sitting behind me. I am so impressed he made it! All that water gushing by... And the big splash must have felt terrible to his poor tortured bladder. Poor little dude. For half the post I thought the person next to you was just some (very open) random guy...that would have been super awkward. Oh geez . . This sounds like something that would happen to me! The ride at Disneyland that broke down when I was on it was those gondolas that went through the Matterhorn. When I found out they closed that ride down, it didn't surprise me at all. 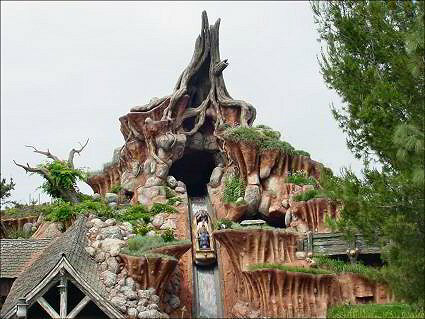 Forever and always, our family affectionately refers to Splash Mountain as "BO Mountain". My husband is convinced that the liquid in the mountain is really the sweat of thousands of Disney guests harvested during the hottest days of summer. My girls always try to bribe me to ride along...no doing! I can handle the scariest of roller coasters, but BO Mountain does me in every time! I was there the same day! Hate to say it but I was so glad it broke down because the line went down to almost nothing :) It opened right as we got in line and we didn't have to wait but like 10 minutes...we were thrilled. Sorry you paid for that though!